INDIANAPOLIS (July 8, 2013) — Klipsch, a leading global speaker manufacturer, announces today the appointment of Sarah Fisher Hartman Racing (SFHR) and Josef Newgarden as official brand ambassadors. 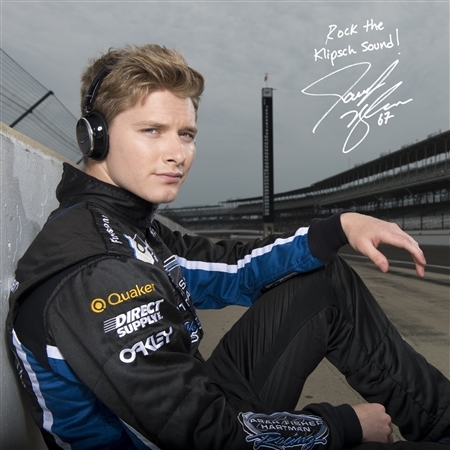 As a professional racecar team and driver competing in the IZOD IndyCar Series, Klipsch envisions a long-term relationship that seamlessly integrates SFHR and Newgarden into all facets of the brand. SFHR and Newgarden will be incorporated heavily into the product development and marketing efforts serving the brand itself, as well as its headphones and home audio products. Klipsch headphones and audio equipment are highly present among SFHR’s mechanics, engineers and staff. In addition, the team’s new 40,000-square-foot race shop utilizes Klipsch speakers for its large indoor and outdoor venues to create an acoustic layout with ideal sound absorption and projection specifically designed for their space. Proving invaluable will be Newgarden’s youthful insight and guidance as Klipsch works to develop fresh, lifestyle-focused products that meet the needs of new demographics, while still incorporating the brand’s legendary audio performance. SFHR and Newgarden are currently competing in their second season together and hold 15th place in the IZOD IndyCar Series championship standings. For the latest news from SFHR and Newgarden, follow @SFHRindy and @josefnewgarden on Twitter.